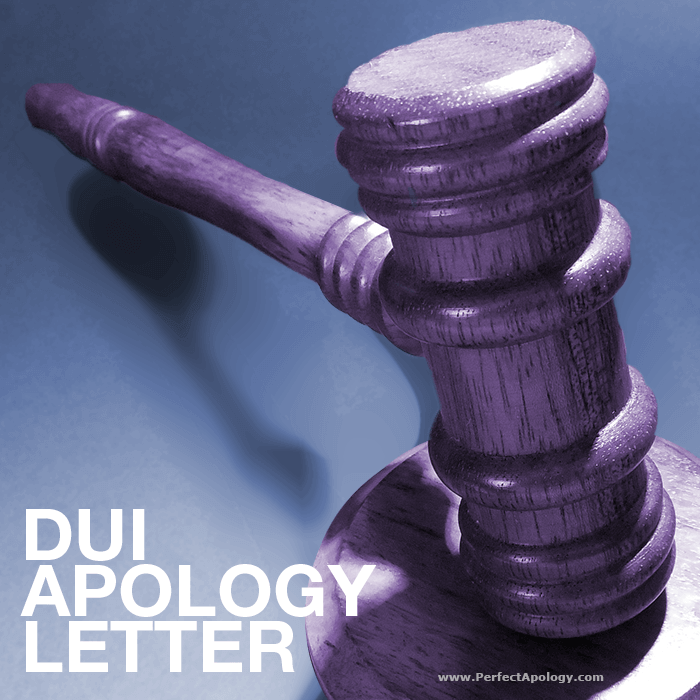 A DUI apology letter is written for many reasons. It may be needed for court hearings before a judge. It may be required by an employer. Or, it may be that the person who committed the act feels it's important to do, as a way of showing their remorse and regret. DUI is a serious crime where lives are at stake. And, like with all legal matters, a lawyer should always be consulted. The guidelines and sample DUI letter below is for informational purposes only, and does not constitute professional advice. Regardless of who the letter is directed to (judge, employer, family, etc.) the number one thing that the letter needs to convey is that you fully understand the seriousness of your actions, that you take responsibility and by doing so, are taking appropriate action to ensure that it doesn't happen again. This changes depending on who the letter is directed to and is the first indicator to the recipient that you are showing them respect and understand the gravity of the situation. Use this formal address for employers or any other individuals. When you don't know the name of the judge. When you do know the name of the judge. Use 'Your Honor' within the body of the letter. Open with the reason for writing the letter. I am writing this letter to express my deep regret and remorse for my reckless and dangerous behavior. Confess and apologize with a detailed account and specifics. You can also provide a little information about yourself. As a family man and father of two, I've always tried to do the best I can and live my life with honor. I clear failed on _____________ (date and time). I was drunk and got behind the wheel of a car which is extremely dangerous and irresponsible. I shudder to think of what could have happened. (If harm was done to others or property, you need to mention it here). If writing to an employer: I am so very sorry for my actions and would like to apologize to you ______________(Mr./Mrs./Ms. &plus; surname) and to every employee of [company name] whose reputations I may have tarnished through my poor behavior. Acknowledge the hurt, damage done and implications. *Depending on your situation, and if there was damage to persons or property, specify it here in detail along with the implications, and address apologies to the victims as well. There are no excuses and I take full responsibility for my actions. *If this is a first offense, state it and mention how you've never been so reckless in the past. If you've been found guilty of drunk driving before, you need to mention it. I will not let this happen again and have [ enrolled at Alcoholic's Anonymous / DUI School ] to ensure that it doesn't. I have also spoken with counselors /psychologists to help me understand why I chose to expose myself and the community-at-large to the danger of drinking and driving. * If property damage occurred, state clearly how you are going to fix the damages. Although nothing can change what I have done, if there is anything that I can do to somehow make up even a small portion of the damage I have caused, please let me know. The Notes and Italicized Tips we include should help you customize our sample DUI apology letter to your own situation. 1. Type your letter, it can be handwritten if you have very good handwriting. 2. Be sure to sign and date the letter. 3. Be personal and honest. Your heart needs to come through in the letter. 4. Be accurate. No exaggerating or stretching of the truth, it will only hurt you. 5. You can explain the implications on your license being taken away without making excuses. 6. You can also explain the consequences to your life of a criminal conviction. Again no excuses, just facts. Learn more about writing a formal apology letters.